How are the results of my Pulse survey displayed? The individual dashboards show information gathered by the Weekly/Monthly Pulse questionnaire. Which dashboard shows which results? 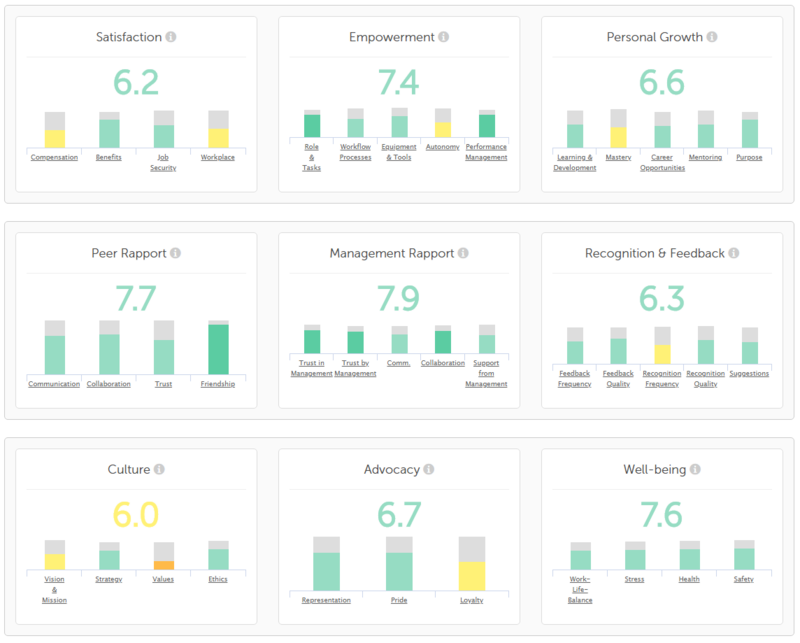 This dashboard shows the Engagement Score which is the average of the 9 metrics which make up this survey. 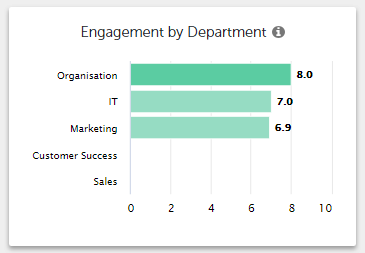 The Engagement chart shows the total result including a comparison to the previous week and the Engagement History chart shows the results of the last calendar weeks. Secondly, the results of the themes discussed in the survey are displayed using 9 metrics and a varied number of submetrics. 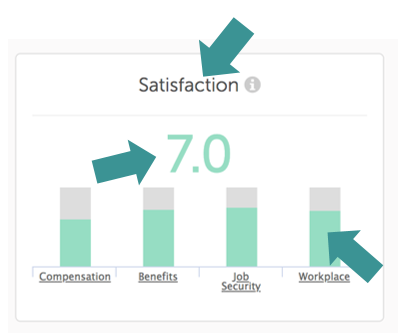 Satisfaction: Compensation, Benefits, Job Security and Workplace. Empowerment: Role & Tasks, Workflow Processes, Equipment & Tools, Autonomy and Performance Management. Personal Growth: Learning & Development, Mastery, Career Opportunities, Mentoring and Purpose. Peer Rapport: Communication, Collaboration, Trust and Friendship. Management Rapport: Trust in Management, Trust by Management, Communication, Collaboration, Support from Management. Recognition & Feedback: Feedback Frequency, Feedback Quality, Recognition Frequency, Recognition Quality and Suggestions. Culture: Vision & Mission, Communication of Strategy, Values and Ethics & Responsibility. Advocacy: Championship, Pride and Commitment. Wellbeing: Work-Life-Balance, Stress, Health and Safety. If you place your cursor above a submetric, its individual result is shown. 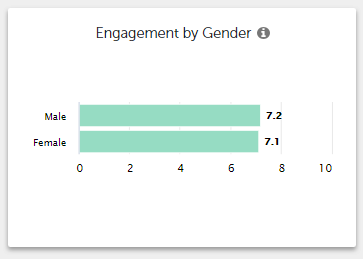 The total result for the metric is displayed above the chart in figures and the colour of these figures indicates how good or bad the total feedback for this metric was. The Deep Dive will appear. Just as with the Engagement Score, the diagram on the left shows the total score and the line chart on the right shows you how the score has changed over the last weeks or months (depending on which kind of Pulse Survey you use). Read more about managing employee groups here. the results of each individual question in this submetric plus whether it has improved/worsened since the last period. Read more about creating employee groups here. 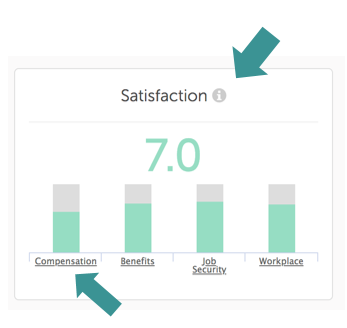 In this dashboard, the eNPS (Employee NPS) results of the survey are displayed. These are shown in months and not weeks as NPS questions are asked just once, at the start of each month. The eNPS gauge shows the total result with a comparison to the previous month and the eNPS History line chart shows the results of the last months. Your average is shown here compared to the company's average. All answers to the open questions of the Weekly Pulse Survey are shown here. Can I choose to display results for particular periods of time in the dashboards? Both the ENPS and Open Question dashboards can be displayed monthly. However, this is not the case with the Weekly/Monthly Pulse dashboard. With both of these, it will depend on your chosen settings. If you have created your own surveys, you will of course have the possibility to create dashboards for these too. Learn about creating new dashbaords here or about creating new surveys here.